Hi Jane. It always amazes me how you manage to get all the crust off the pan so beautifully. Mine always sticks to the pan as I unmould it! I share the same sentiments too! I'll never get sick of chiffons! It's so light you just eat a few slices without noticing it, isn't it? I still have bake pandan chiffon yet, hope I can squeeze out my time to do the baking. 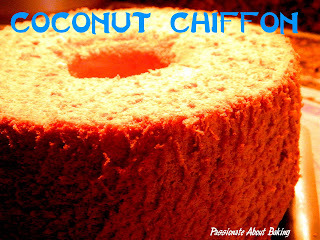 your coconut chiffon looks so yummy, I bet I will like this as well! great idea using coconut !! I must try this recipe soon!! thanks for sharing! Thanks! Do try the pandan chiffon, it's really good. This texture is quite different from Pandan chiffon. I still like the Pandan chiffon. Yes, this is one way to use up whatever coconut you have! Do let me know if you like it! Nicely baked chiffon cake, Jane! 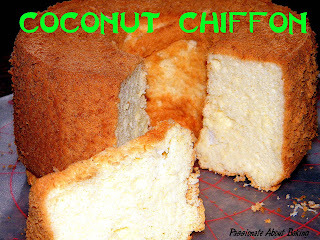 It looks very soft and I'm sure the coconut had given the chiffon some extra texture. Nice one! Thanks. Ya, you can literally chew the desiccated coconuts! Do try it! Yesterday after reading this blog, I was determined to try it out when I reached home. Last night I did bake it. It was sooo nice. The last time I baked a chiffon cake was during my home econs class about 30 yrs ago and it was a disaster. Since then I was wary about baking it. But the cake I baked turned out soo well that once it cooled down me and hubby finished almost 3/4 of it. Thanks for sharing the simple and fuss free recipe. Now I'm inspired to bake more often. Yes its so nice to have the sense of satisfaction of a self baked caked that the family members enjoy. I did 2 more of the same cake for mothers' day for my mum and mum-in-law. This time round I mixed half the coconut with pink and the other half in green. It looked so nice when it was cut. Next I'm gonna try your yummy orange cake. May I know if I can use fresh coconut milk and fresh grated coconut? Yes, you can replace them equally. Shouldn't be a problem.